but that very Spirit intercedes and prays within us with sighs too deep for words. all limitations and entering, simply into God’s presence. from the Spirit living and at work in us. It is God in us serving God in others. glory, now and for ever. Every day, pray for peace. St. Luke’s has a noteworthy relationship with SOS Community Services helping to provide the homeless and those in crisis with food, clothing and incidentals. St. Luke's also helps the community through partnerships with the Ann Arbor YMCA and Washtenaw Literacy. Classes are held locally and at the church. The mission of the Youth Ministries is to engage, equip and celebrate the power and presence of youth, young adults and those working with these populations allowing young people to explore their relationships with Jesus, each other and the world. St. Luke’s Church is committed to doing its part in providing a spiritual foundation for its children. We get wonderful age-appropriate ideas for teaching the children about God and Jesus and the Bible from the Episcopal Church School teaching series called Living the Good News. Our mission in the classrooms is to guide the children in their understanding of who they are, why they are special, who is Christ, how they relate to Christ and how through Christ they relate to the world. We do this through a variety of methods, including Bible stories, art projects, games, and gospel readings. Our goal is to prepare our children for the future, armed with the knowledge of Jesus’ teachings, power and love! The Prayer Chain Ministry prays for the sick, recovering, and housebound members and friends of St. Luke's Church. Lay ministers assist with the chalice during the celebration of Holy Communion. They also provide regular Liturgical outreach at the Gilbert Residence in Ypsilanti. St. Luke’s Choir, under the direction of Dr. Marijim Thoene, is an important part of our services. Membership is open to all. No audition or prior experience is required. St. Luke’s presents special and seasonal programs for EMU students, faculty, staff and alums—at church, on campus and around town. Parishioners with an interest and love for gardening/ lawn care share their gifts with St. Luke’s. Adult communicants in good standing are eligible for nomination to serve on the Vestry. This group oversees the business aspects of the church and offers support to the Rector. 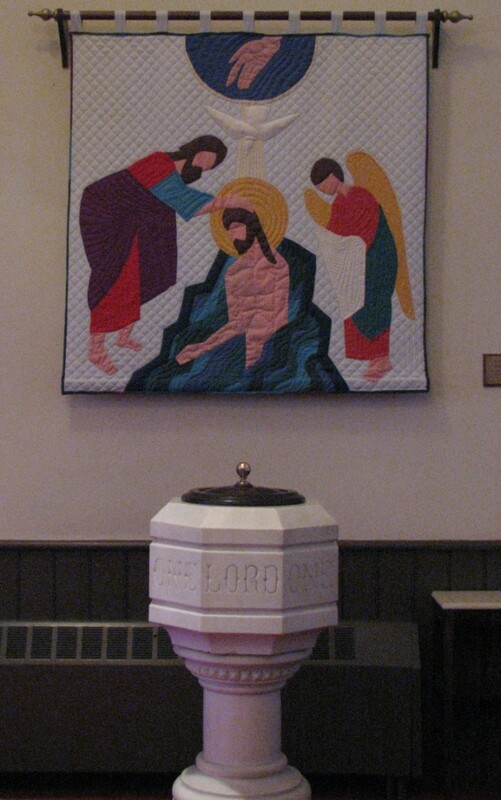 More recent additions include the 1987 ceramic Stations of the Cross by local artist and art educator Gawaine Dart. Prof. Dart placed his realistic depictions of the Way of the Cross in neo-Gothic frames with crockets and fleur-de-lis echoing decorative motifs in the church, especially the carving on the choir stalls. Dart, retired chairman of Henry Ford Community College’s art department, along with his wife, Jane McAllister Dart, also designed the decorative stenciling in the Lady Chapel. The patterns used were original interpretations of authentic 19th century designs. St. Luke’s has a large, auditorium-type nave – much like the Protestant meeting houses of the 18th and early 19th centuries – while the emphasis on the altar and the majesty of the Gothic architecture reflects the Church’s Catholic heritage. This balance of traditional and reformed elements is typical in a mid-19th century Anglican Church. The plan of St. Luke’s reflects the shift in taste in the Victorian era from religious architecture (based on Classical models) to those of a medieval flavor. 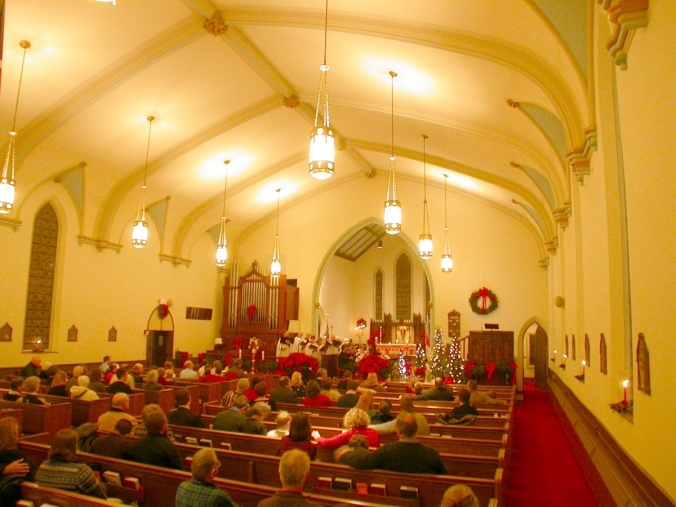 Although the interior has been remodeled and redecorated several times since the church was built in 1858, it has not changed appreciably since the 1940s when a dark oak and stained glass screen was erected to divide the narthex from the nave. The organ now in use was donated by Dr. John Sill in 1885, during his tenure as principal of Michigan Normal School (now Eastern Michigan University). He also donated the altar that is still used. Other church furnishings were given as memorials over a period of time from the late 19th century to the present. Dating to an early period of interior redecoration is the altar, consecrated on Epiphany 1889.The brass eagle lectern and the wine-stem dark-oaken pulpit were memorials to the Rev. Dr. Gardham. The dark oak choir stalls, rail in front of the choir and fine brass gate were a memorial to Mr. and Mrs. Daniel Quirk, given on Easter 1916. The present altar rail and matching reredos (the screen behind the altar) were installed in the 1950s, along with the lighting fixtures and pews. At one time the walls of the nave featured joyous, colorful stenciling, likely dating to a decorative program implemented in the early 1900s by Mrs. Mary Chase Smith Gardham, wife of the rector of St. Luke’s. Mrs. Gardham, herself an artist, may well have been responsible for much of the late Victorian decoration of St. Luke’s. While the parish of St. Luke’s began worshipping at the address currently designated as 120 North Huron in 1830, it wasn’t until March 14, 1840, that the property deed was conveyed from the City of Ypsilanti to the Right Rev. Samuel A. McKorsky, Bishop of the Diocese of Michigan, in consideration for $1,600. As early as 1814 this same plat had been sold to Gabriel Godfroy, Sr. (of Godfroy’s Trading Post) for the consideration of $100. Godfroy, in turn, sold it to Henry I Hunt in 1824 for $816. The original structure was a simple frame building (probably originally built as a home), and by 1837, it was clear that a new structure needed to be built. It was completed in 1838 and dedicated on July 1 of that year. It was an uphill battle to get this project off the ground and, finally, completed. It turned out that the battle would not end there, though, as the parish had difficulty meeting its financial obligations and would have lost the building had it not been for a $1600 ($2000 with interest) loan from the Missionary Committee of the diocese. The total cost of this structure (furnished) was $15,000. It was designed by Detroit’s premier architectural firm, Jordan and Anderson, and is one of the oldest, thoroughly Gothic Revival churches in Michigan. The structure reflects the changing tastes in, and theories of, ecclesiastical architecture. Early 19th century architects had used pointed ornaments on their buildings and called the resulting design “Gothic.” The interest in building new structures based on medieval forms and decorations, even to the point of copying actual medieval structures, had its origin in the High Church movement of 19th century Anglicanism. The success of that movement is evident in the fact that, when most people think of church architecture, it’s medieval architecture that comes to mind. The design of St. Luke’s is modeled after Gothic-inspired churches, including St. Paul’s, Detroit. The plan is basically that of a central, gable-roofed box with a tall tower and spire on one side of the facade, and a smaller turret – or pinnacle – on the other. The elevation features pointed arch window and door openings, prominent buttressing, pinnacles, and gables, making it a somewhat subdued example of mid-Victorian Gothic Revival architecture. Numerous churches were built in Michigan using this same basic plan. St. Luke’s was the first outside of Detroit and stands as a monument to the importance of the City of Ypsilanti in the mid-century. Inset over the west-end lancet windows is a great St. James Cross, an homage to the short-lived, fledgling Episcopal congregation of St. James which was reorganized into St. Luke’s. The exterior view of St. Luke’s has not changed greatly in the past 130 or so years. Except, the spire (the tallest in Washtenaw County) was (sadly) taken down in 1971 in response to concerns about its structural integrity. Apparently, the heavy traffic on Huron Street created vibrations which lead to serious safety concerns. The bell (manufactured by the Meneely Bell Casting Company in Troy, New York), which was originally housed in the spire, was then moved into the Cloister Garth memorial garden. Instead of tuning his bells, Clinton Meneely relied on exact profiles and, if necessary, cast again and again until he achieved the desired result. Two separate factions of the Meneely family operated two foundries which together are said to have produced 65,000 bells in their life. Alas, they are no longer in production today. On October 20, 1974, the Rev. Sidney Rood consecrated the Cloister Garth (a small, enclosed garden) for the interment of ashes of deceased parishioners and friends of St. Luke’s. Designed by landscape architect and parishioner Arthur J. Howard and made possible by a gift from parishioner Marion Stowe, the Garth is a place of beauty and repose at all times of the year. In every season, flowers and shrubs enhance the New York bluestone and the St. Francis statue and the mural of the “Good Shepherd” by Jane McAllister Dart, a retired professor of art at Eastern Michigan University. The church itself is built of soft “Chicago” red brick. The lintels, sills, water tables and other architectural elements, which appear to be stone, are actually of the same red brick, coated with a limestone-colored mortar. Unfortunately, this decorative treatment tended to trap dampness which, in the course of the freeze-thaw cycle and general expansion due to moisture, has resulted in some breaking of the bricks. In addition to the sanctuary, St. Luke’s includes two other buildings to the north of the sanctuary. The original “Parish House,” built as a rectory, was removed in 1927 to make room for the current building, which was finished in 1928 (cost: $71,000). A housewarming was held in September 1929 and was packed by community members. The “50s” building – which houses classrooms and offices, a kitchen and meeting spaces, including the “Great Rood Hall” (named for the late Rev. Sidney Rood) was completed in 1955. This is truly a “50s” building, exhibiting the style (or lack thereof) of other buildings erected during this decade. In 1834, Rev. Freeman resigned and Rev. John P. Bausman was appointed as “missionary in charge.” He stayed for only a year. It is unclear who was running the show from Rev. Bausman’s resignation until the diocese appointed the Rev. Charles Reighly in 1837, directing him to reorganize the parish; which he did, with the new name of St. Luke’s. After Rev. Reighly’s resignation (probably in March 1839), Rev. F. Dr. Frances Higgins Cummings held services until the vestry invited Rev. Henry P. Powers to take charge. Rev. Thomas W. MacLean served as rector from 1882 to 1885. The Rev. Deacon John Mahelm Berry Sill, during his tenure as principal of Michigan Normal School (now Eastern Michigan University), appears to have been the sole clergy from the time of MacLean’s departure until the arrival of Rev. Montgomery S. Woodruff in August 1888. (Woodruff apparently has no connection to Benjamin J. Woodruff, founder of Woodruff’s Grove.) 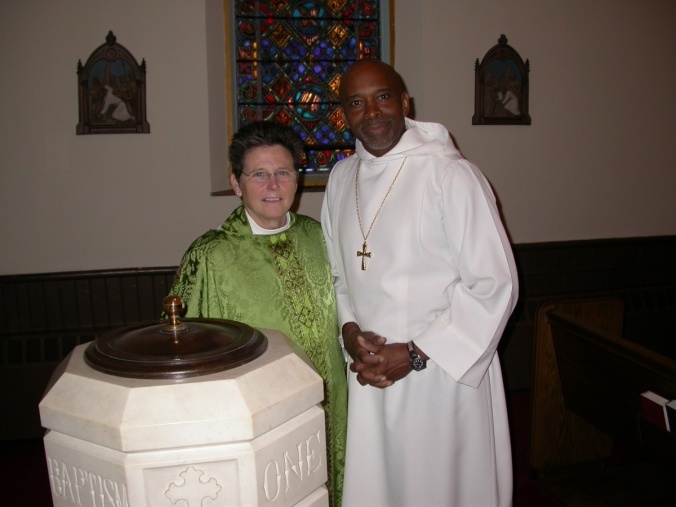 He remained at St. Luke’s for four years, also serving in Belleville during that time. Rev. Montgomery Goodwin succeeded Woodruff in 1892. Four years later, when Goodwin was appointed to a chaplaincy in the U.S. Navy, Rev. William Hothersall Gardam became St. Luke’s rector. Gardam was born, educated and ordained in England and found the many traditions of St. Luke’s to fit well with his own. The first mention of a rector’s wife is that of Mary Chase Gardam, who was great granddaughter of Bishop Philander Chase, first missionary bishop of Ohio and Michigan. She was, apparently, a tireless worker for St. Luke’s, visiting the sick and organizing the well. Rev. William Heilman began his work at St. Luke’s in 1915, coming from Lexington, Kentucky. The times were unsettled and war was freely predicted. When the call for volunteers came in 1918 from President Woodrow Wilson, Rev. Heilman promptly responded, enlisting as a chaplain in the Army. The next two years were full of uncertainties. Rev. Thornton Denhardt of Denver, Colorado, acted as supply rector for a time; and the diocese often supplied clergy, including Dr. William Sayers, who preached frequently at St. Luke’s. At the close of the war, Rev. Berton S. Levering came to St. Luke’s from St. Peter’s Church in Delaware, Ohio. He preached his first sermon at St. Luke’s on January 12, 1919, and became rector just two weeks later. Levering’s tenth anniversary was celebrated with a gala dinner on March 12, 1929; but in September, he announced his resignation – in order to take charge of All Saints Chapel in Detroit. On January 5, 1930, the Rev. John Francis Sant became rector of St. Luke’s, coming from St. Joseph, Detroit, but left four years later for the larger Christ Church, Detroit. He was succeeded by the Rev. Robert Lawson (1934-38), the Rev. Reginald T. Appleyard (1938-44), the Rev. Robert Lionne Dewitt (1944-48); the Rev. Hugh Carleton White (assistant from 1947-48 and rector from 1948-52) and the Rev. Richard Harold Schoolmaster (1953-58). The Rev. Sidney Swain Rood arrived in August of 1957, having already founded churches in Houghton Lake and Gladwin. By all accounts, he was “. . . at the heart of caring for people in Ypsilanti. He worked with anybody in need – alcoholics, people in halfway houses, food drives clothing . . . . He touched the lives of many, many people.” Sadly Rev. Rood’s life was cut short (at 63) by a sudden heart attack while in the sacristy preparing for the 10:30 a.m. service on Sunday morning in July 1982. The Rev. Jasper Pennington arrived in 1983 and presided until 2001. The Rev. Dr. JoAnn Kennedy Slater had an inauspicious beginning at St. Luke’s. 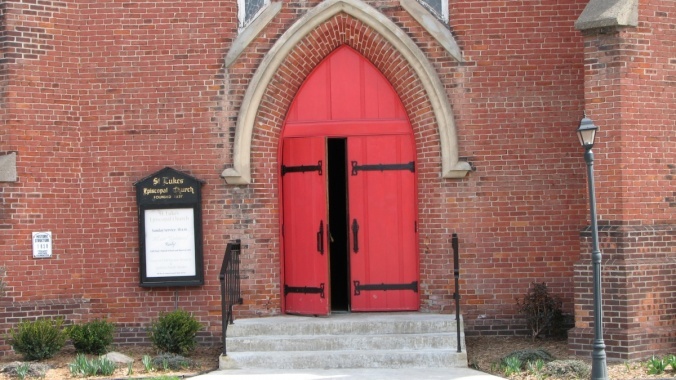 The parish was in turmoil, and Bishop Wendell N. Gibbs, Jr. warned the congregation that the doors of St. Luke’s were in danger of being closed. That was the bad news; the good news was that he believed in St. Luke’s and offered diocesan help. Even better news: The parish believed in itself. The journey from 2001 to 2006 was a bumpy ride, but St. Luke’s has emerged stronger and more alive than ever, building on the foundation of the last 177 years. A sign of that success was the appointment of the Rev. Slater as rector in November 2006. In a tiny birch-bark canoe one Sunday morning in 1802, a Church of England clergyman, the Rev. Richard Pollard, paddled across the Detroit River on his way from Sandwich, Ontario, to the small frontier trading post of Detroit. This, to many, was the beginning of the Episcopal Church in Michigan. For over 20 years, Rev. Pollard held services for some 30 families in the Indian Council House (at the present corner of Jefferson and Randolph Avenues). Thus his parish, St. John’s Church, Sandwich, has often been referred to as “the Mother Church” of the Diocese of Michigan. Many, however, prefer to give this title to St. Paul’s Church, Detroit, organized in this same Council House on November 22, 1824, under the leadership of the Rev. Richard Fish Cadle. Four years later, Bishop Hobart of New York consecrated the first building of this first Episcopal parish in the whole Northwest Territory. This earliest Gothic structure in Michigan, with its two-storied tower, stood on lower Woodward Avenue, between Congress and Larned, flanked by a Presbyterian Church on the south and a Methodist Church on the north. Remember that there were only eight or ten families in Washtenaw County at this time! In 1829, the Norris family moved to the area, with Mrs. Mark Norris immediately assuming a leadership role in the life of her new community. Her search for an Episcopal minister, at the request of an ill friend, resulted in a visit from Rev. Cadel from Detroit. Later that same year, he came to Ypsilanti to hold services in a vacant room a few doors west of the Hawkins House (on West Michigan Avenue where the Ann Arbor News currently has their Ypsilanti office). Also in 1829, Episcopal layman Andrew Cornish, a Justice of the Peace, came to live in Ypsilanti. He held weekly lay services for a small group of Episcopalians (sometimes at a hotel, sometimes in a school house and often in private homes) until the arrival of the first resident priest. That priest was Rev. Silas C. Freeman (“a man of more than ordinary talent, of commanding form and noble voice”), who came to Ypsilanti 1830. And thus, the Ypsilanti parish was born at 120 North Huron Street. Only the name has changed in the last 177 years, making St. Luke’s the oldest extant church in Ypsilanti. 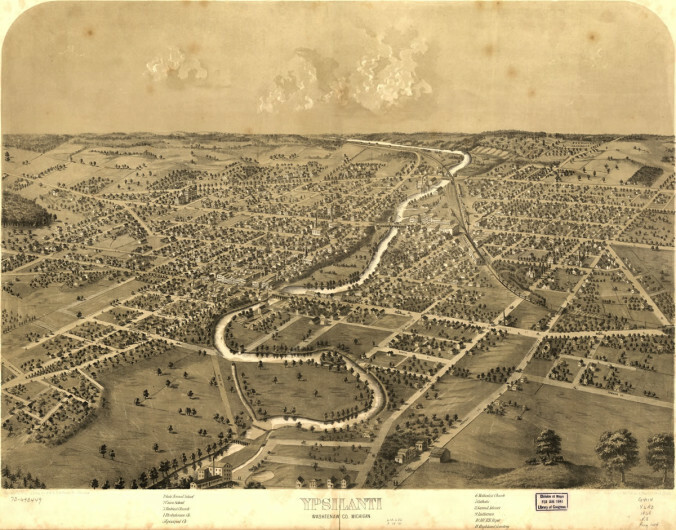 On that first Sunday morning, the City of Ypsilanti had been chartered for just five years, stagecoach travel from Detroit had only recently become possible, and the military Chicago Road (now Michigan Avenue) would not be opened for five more years. Then, as now, the Huron River flowed steadily by. In 1832, the Episcopal Diocese of Michigan was organized by Episcopal parishes in the “territory” of Michigan (which included present-day Wisconsin). It would be five more years before Michigan became a state. With its founding predating that of the Diocese, St. James’ was named as one of the six founding parishes. The Gilbert Window (The Incarnation Window) , memorializes Alice H. Gilbert (1861-1946), a member of an old Ypsilanti Family (whose legacy includes the Gilbert Residence for the Aged on South Huron, Gilbert Park, and the restored Gilbert Mansion). 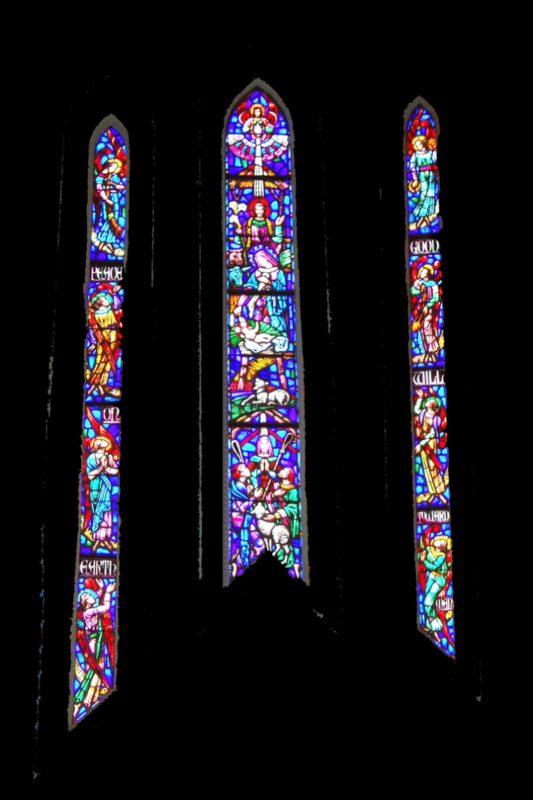 Like the Altar Windows, these over the West Doors are in fact three lancet-shaped windows and they depict the cast of characters which appear in the Christmas Story from the Gospels – shepherds, angels, wise men, animals – as well as the Baby Jesus, Mary and Joseph.